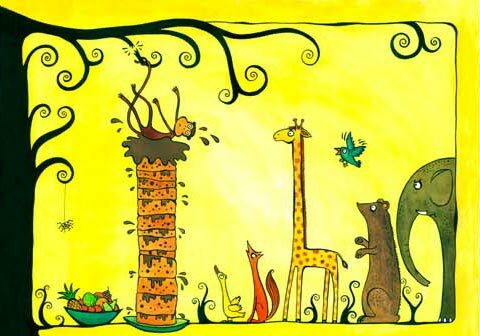 Indian artist Proiti Roy has illustrated many picture books for children, as well as text books, book covers and magazine articles. 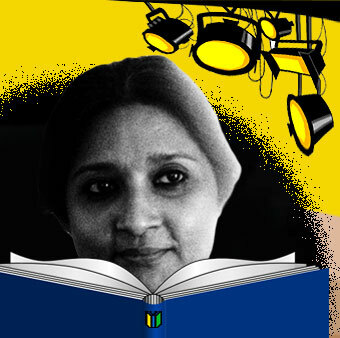 Before ‘settling down to become an illustrator’, Proiti worked as a graphic designer in advertising and manufacturing, both in India and Bangladesh. 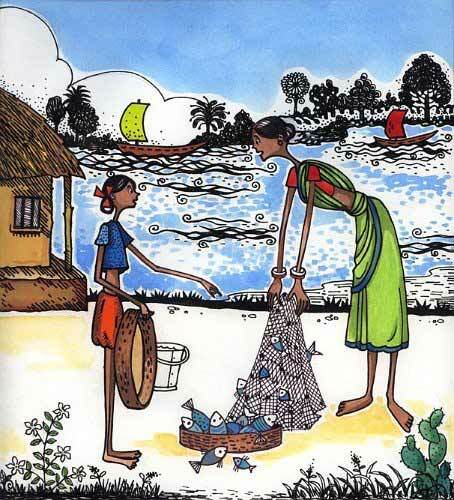 She also worked with handicrafts in recycled mediums and taught art and craft to children in Kolkata for 12 years. 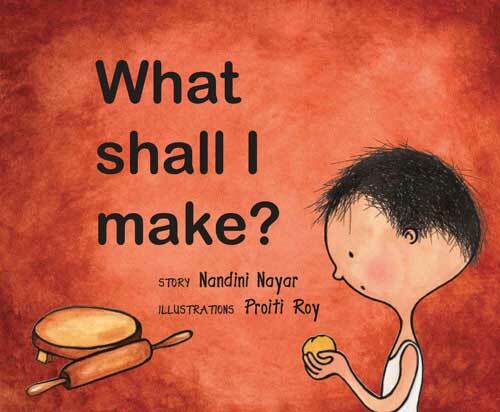 Proiti’s work has been published across the world – her most well-known books are What Shall I Make?, written by Nandini Nayar, and Ismat’s Eid/Nabeel’s New Pants: An Eid Tale, written by Fawzia Gilani-Williams, and both these books feature in 101 Indian Children’s Books We Love edited by Anita Roy and Samina Mishra (Zubaan (India), 2012). However, it is also well worth delving into Tulika Books‘ catalogue to discover the many other gems she has created in recent years. 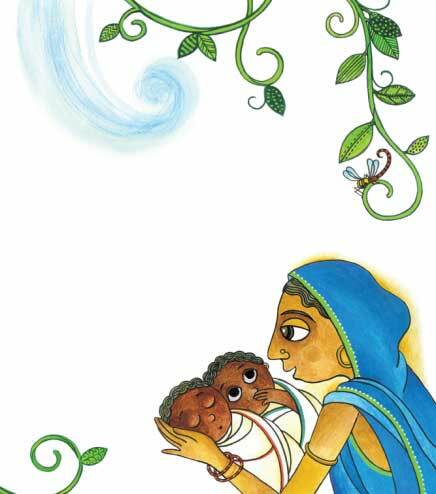 As with all Tulika’s picture books, Proiti’s books are available in different languages: English, Bengali, Gujarati, Hindi, Kannada, Marathi, Tamil, and/or Telugu. As can be seen from this selection of book covers, Proiti’s style is varied and her skill consummate. 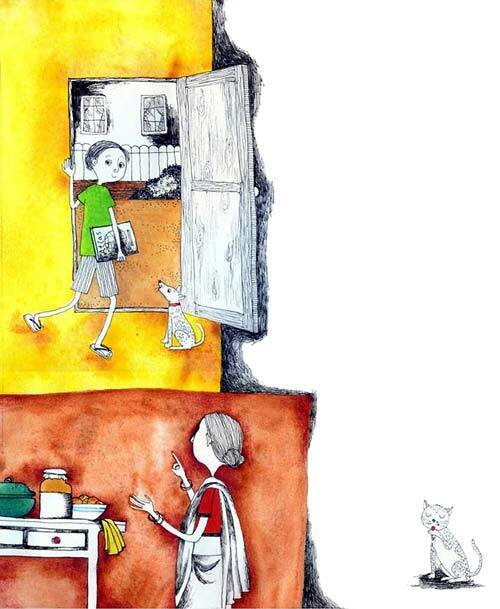 As well as picture books, Proiti is also the illustrator of the latest books in the middle-grade series ‘Aditi Adventures’ written by Suniti Namjoshi: Books 9-12, also available as a single volume, III. Proiti was based until recently in Chennai, Tamil Nadu. 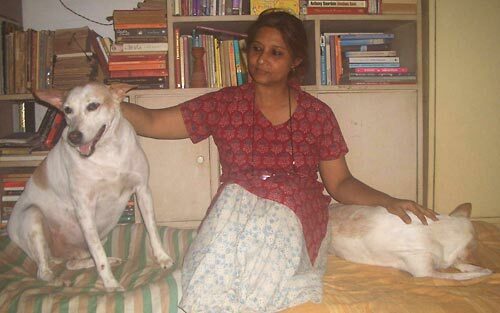 She now lives in Shantiniketan, West Bengal, sharing her home with her many rescued dogs. She has a daughter who is also studying to be an artist. Welcome to Mirrors Windows Doors, Proiti. 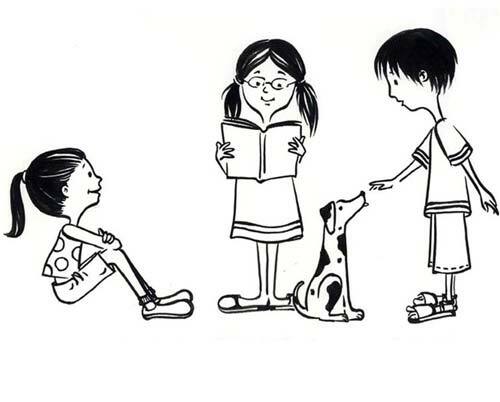 What was your path to becoming an illustrator of children’s books? Thank you Marjorie for having me over here… It’s a pleasure! 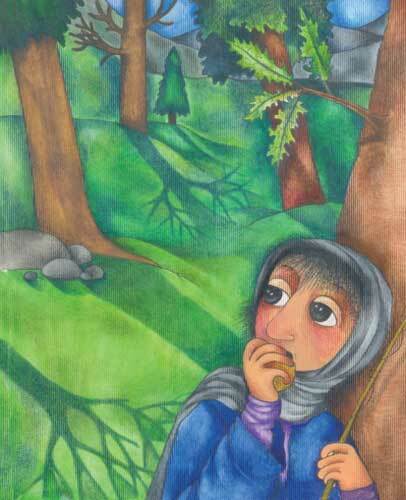 I had been drawn into the world of illustrations since my childhood. 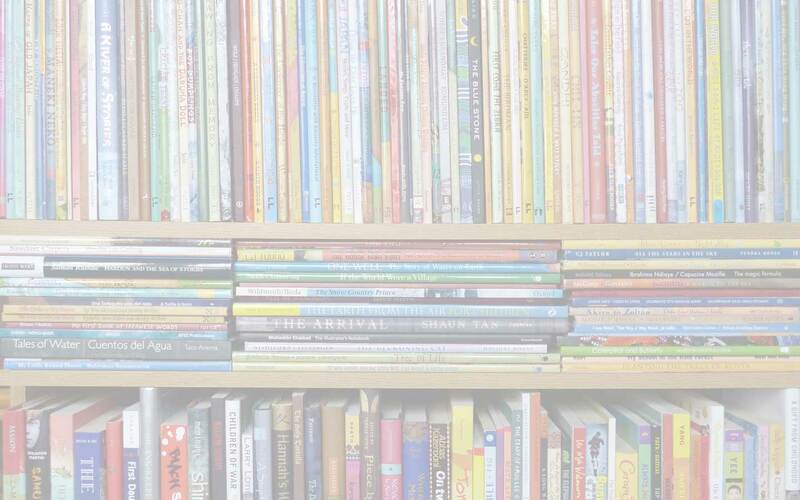 Whenever they could, my parents would buy many books for us (my older brother, a younger sister and me). 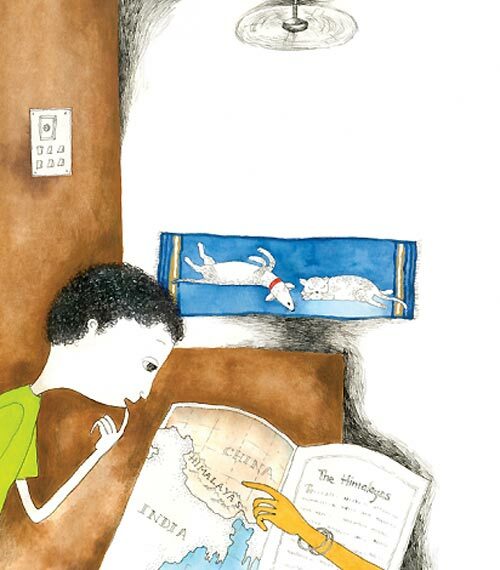 We would spend hours reading and looking at the illustrations. I was always fascinated by the pictures in story books as a child. The pictures would take me to another world… they still do! As I grew older, I developed a keen interest in art and craft and gradually started to get ready to study at an art college. 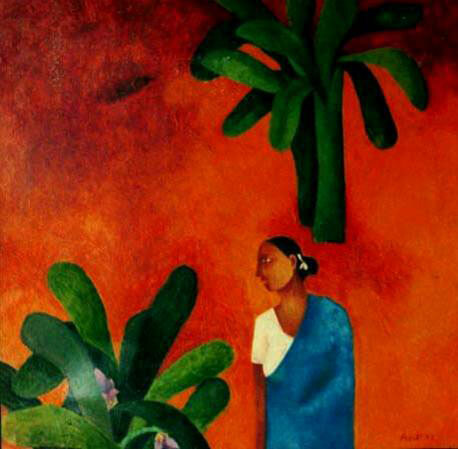 After my graduation in fine arts from Tagore’s university in Shantiniketan, India, I almost immediately got married and moved to Dhaka, Bangladesh. There, I started to work in an advertising agency, where I learned a lot about graphic design, illustration and publishing. Over the next few years, I started to freelance as a designer and illustrator; and I also started teaching children art and craft. So without really planning to do so, I was getting more and more interested and professionally involved in illustrations, particularly for children’s books. And I felt very happy about that… so I decided to take it up more seriously, professionally, and meet a few children’s book publishers. Tulika Books and Orient Blackswan were two of them. After doing quite a few books with them, I was now very sure that this was where I wanted to belong, and I hope I shall be a part of this world for a long time! 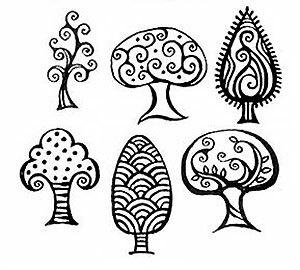 Just by focusing on the trees in your different books, it is evident that you adopt a variety of styles in your art. What are your favourite media and techniques? Yes, I do like to try out different styles and that depends on my mood as well as the story. I use black outlining pens, water colours, gouache paints, colour pencils and coloured ink. I would like to experiment a little more and explore other mediums. My techniques are generally very conventional and traditional. Who or what have been the biggest influences on your art? 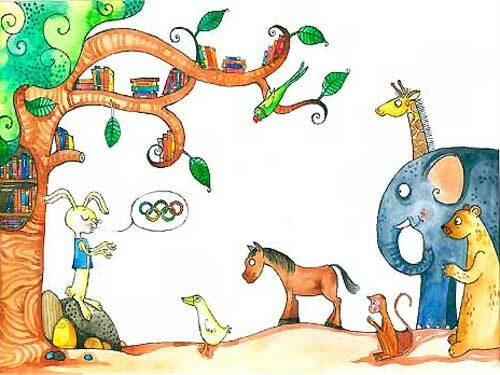 Children, nature, the animal world, works of literature, films, music, dance and different cultures of the world are my inspirations. 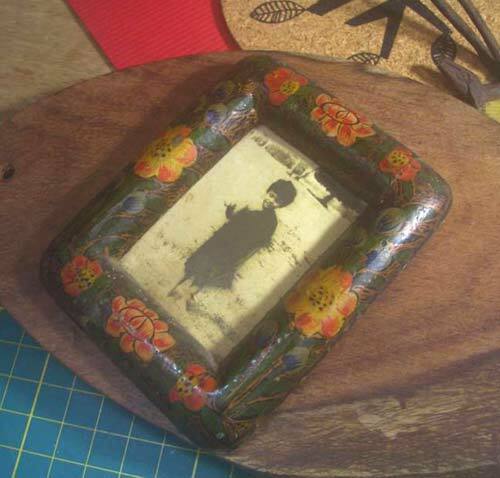 And my mother, who is an artist of extraordinary talent, a very creative person in every sense. And then there are quite a few people in my life who have been inspiring: sometimes as a person; sometimes their talent, their work. What process do you adopt when you take on a new illustration project? I start doodling and sketching the main characters and simultaneously work on different styles and techniques. Gradually I settle down with some ideas I like; then I start with the storyboard – and while I’m at it, I may make changes again and again. My work process is not very systematic… I often do things on an impulse. 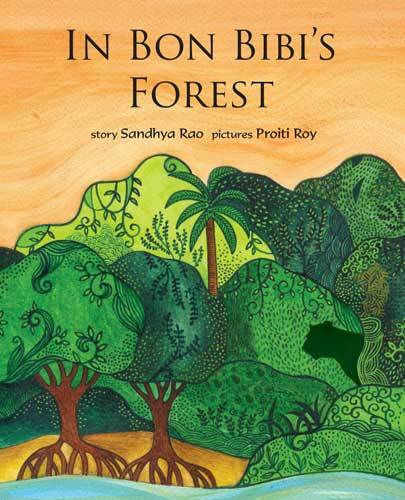 In Bon Bibi’s Forest, written by Sandhya Rao, is set in the Sunderbans, in Bengal, and indeed, the mangrove trees of the region, with their distinctive roots, feature on the book cover. 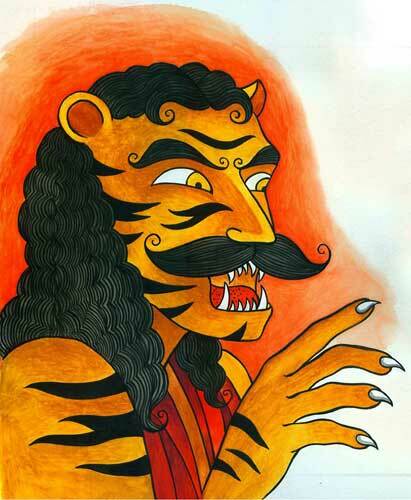 The book is a retelling of the myth of Bon Bibi, ‘lady of the forest’; her twin brother Shah Jongoli, ‘lord of the forest;; and Dokkhin Rai, a man-eating, half-man/half-tiger monster. 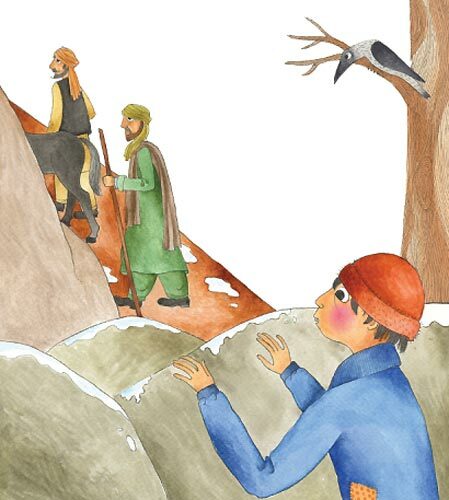 What were your favourite moments, illustrating this story? Yes, it was a story I loved working on. 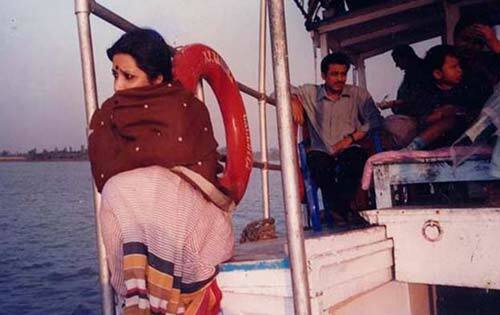 I have been to the Sunderbans and it was a wonderful experience. I never saw nature so closely before! 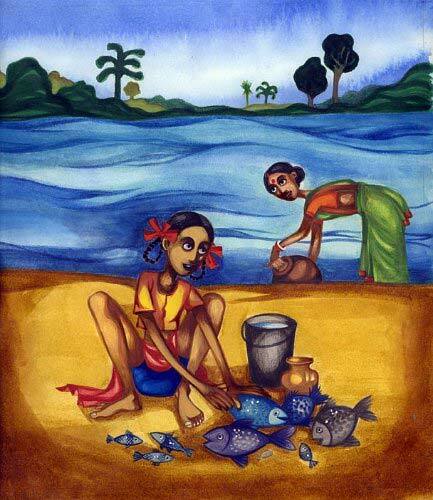 So Sandhya’s story brought back fond memories of my trip to the Sundarbans. I loved giving life to the characters with my illustrations… especially Dokkhin Rai. 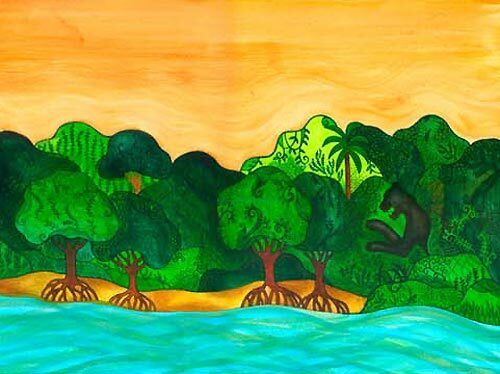 The blurb says of the book that ‘the textured narrative and dramatic, detailed illustrations evoke the distinct culture of the [Sunderbans] – the natural confluence of Hindu and Muslim mythologies, and the rhythm and concerns of everyday life at the edge of a forest.’ What were the challenges involved in illustrating a story with such a unique geographical and cultural setting? As I mentioned, I had been to the Sunderbans but I got to know so much more about life there (the myths, the people, the culture, the geography) while researching for this book. 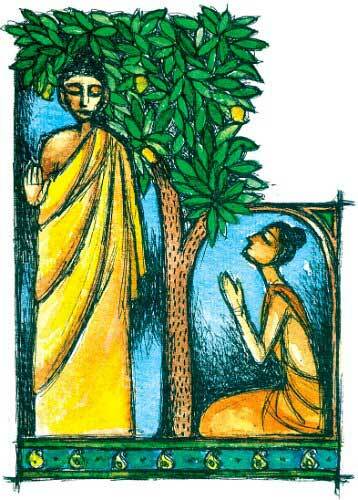 To achieve a sense of secularism in the illustrations was a challenge. 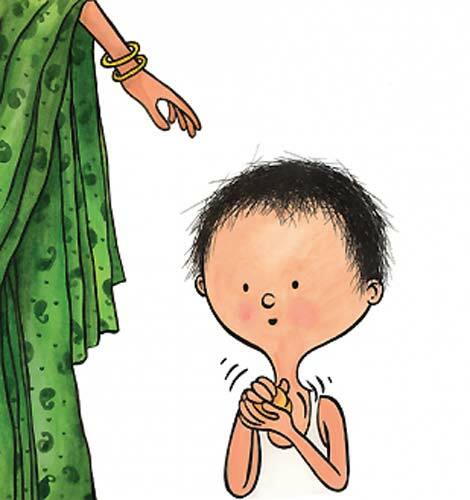 Bonbibi and Shah Jongoli’s characters needed a certain look in this regard. 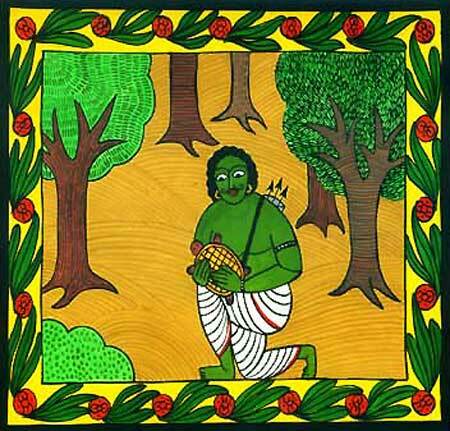 And blending imagination with the local colours, motifs, and myths and getting the right atmosphere in the story. My experience of visiting the Sundarbans had helped. During my trip to the Sundarbans, we stayed on a boat for three days (it’s called a launch boat there), and that gave us an opportunity to interact with the boat captain, his young assistants and a local guy. We would stop at certain places but had to maintain complete silence. 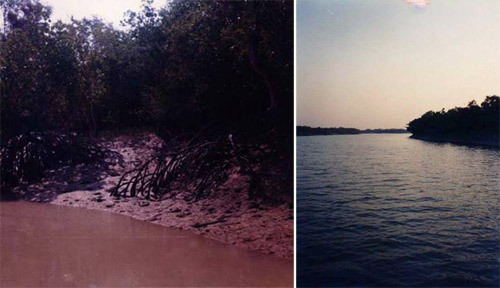 The life of the Sundarbans is absolutely beautiful and frightening, both. We spotted pug marks, saw a huge crocodile sunbathing and even spotted a tiger sitting on the bank of the river watching us calmly. I had never seen a tiger in the wild like this before and this was a breathtakingly majestic animal I saw in front of me. The deer grazing on the banks of the river, the mangrove or sundari trees as they are called locally, the launch ride… it was all so exciting and beautiful. And we even came across a boat that belonged to pirates… but that’s another story! That sounds very intriguing! 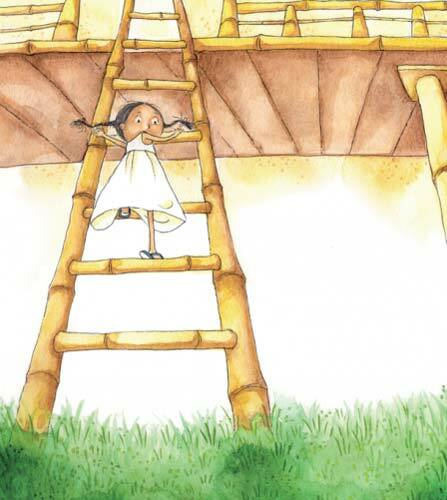 Bulbuli’s Bamboo, written by Mita Bordoloi, is a very different story – its gentle, narrative takes young children through Bulbuli’s day and her encounters indoors and out with the bamboo that makes up her bed, her soup, her house, the gate, the bridge, her boat – and back again, in reverse. I think you had some fun with perspective here? 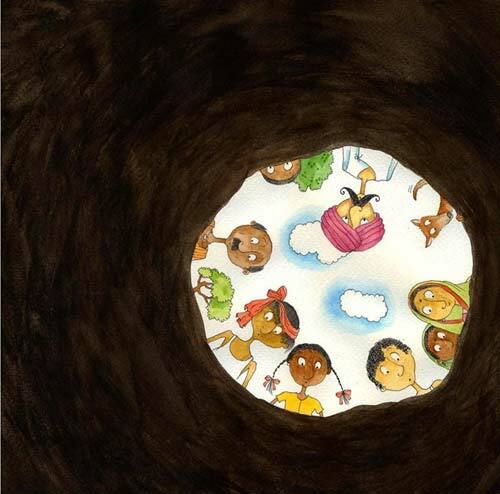 When I read Mita’s story for the first time I felt there was a lot of scope to play around with the visuals and that these would have to be done in an interesting way, so that the repetitive pattern in the story-telling was supported appropriately by the illustrations. I loved the concept of this story. 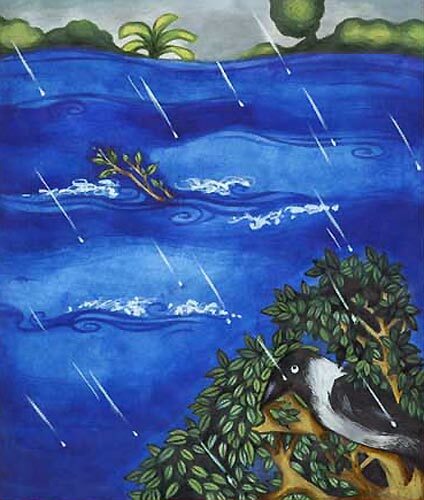 Though it conveyed a sense of serenity, I brought some drama into the illustrations with the perspective. I hope the combination of Mita’s gentle story and my illustrations worked together. 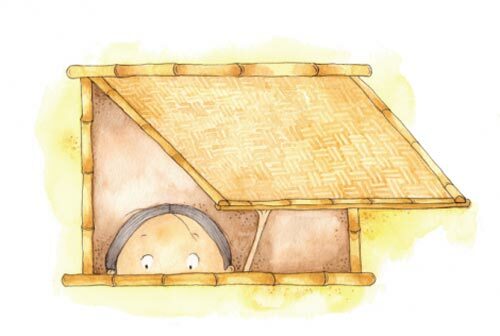 Did illustrating the story make you think about bamboo differently? Not differently but I felt good about the fact that other people would get to know about bamboo and its uses, especially children. 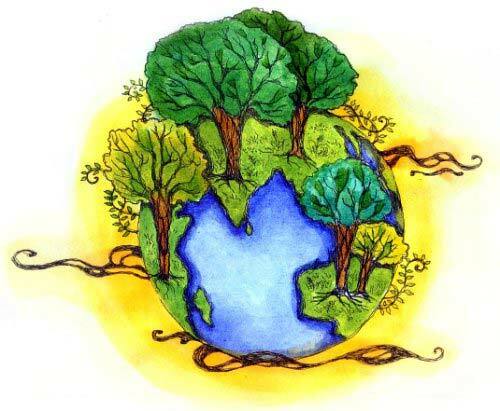 I come from Bengal (a state in India), where bamboo is an important part of our lives. We depend a lot on its various uses. Just recently, I got some fences made from bamboo for my backyard, for my dogs, and I did think of Bulbuli’s bamboo☺! At the end of the story, Bulbuli falls asleep to ‘dream bamboo dreams’. In your illustration, Bulbuli is holding a bamboo branch with a rainbow-striped flag – what is the significance of that, and what prompted you to use that motif? It’s interesting that you noticed! Yes, as children we would very often carry around sticks… any sticks: long twigs, broken branches, the top end of the bamboo that was of not much use… and we would go around feeling important. Maybe it gave a child a little extra confidence, or he or she felt like a leader… you know, just holding it and using it as a walking stick or tying a piece of cloth or a paper flag to it… one could do any nonsensical thing with it and be happy! I used the rainbow colours to signify simple happiness and also to give a touch of multicolour, as the rest of the book had a lot of green. 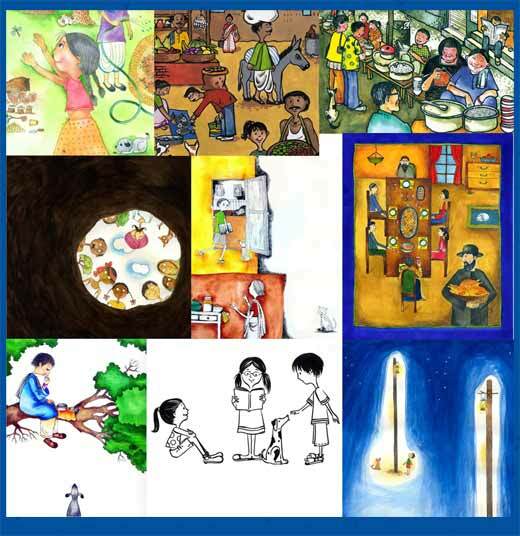 Your illustration style in Bulbuli’s Bamboo echoes that of What Shall I Make?, which was selected by USBBY as an Outstanding International Book in 2010. Can you tell us something about that project? What Shall I Make? 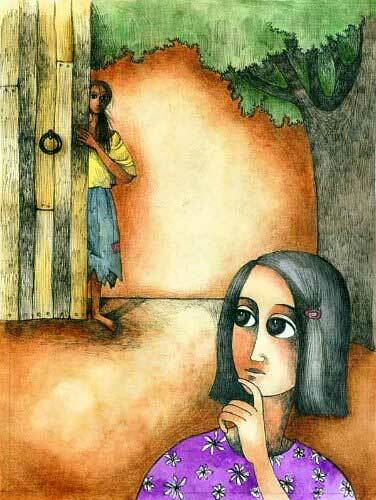 was the second book I illustrated for Tulika. And it was love at first reading! The story was so simple and charming and I think everyone can connect with its scenario. 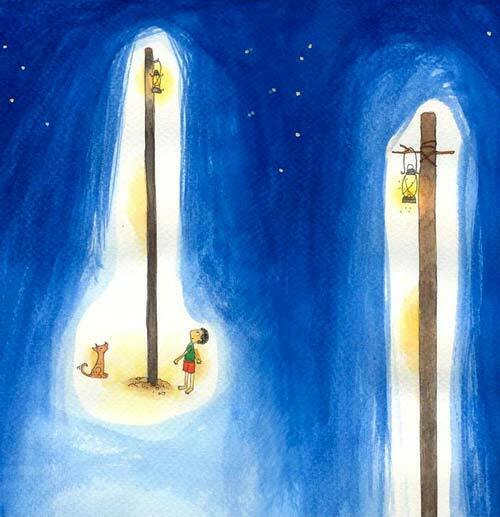 The warmth that comes through in this little story was very touching and I responded spontaneously with my illustrations. 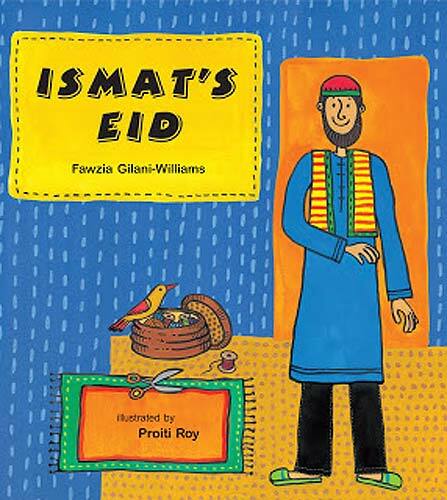 Your other book that has received international recognition is Ismat’s Eid, the delightful retelling of a Turkish folktale. 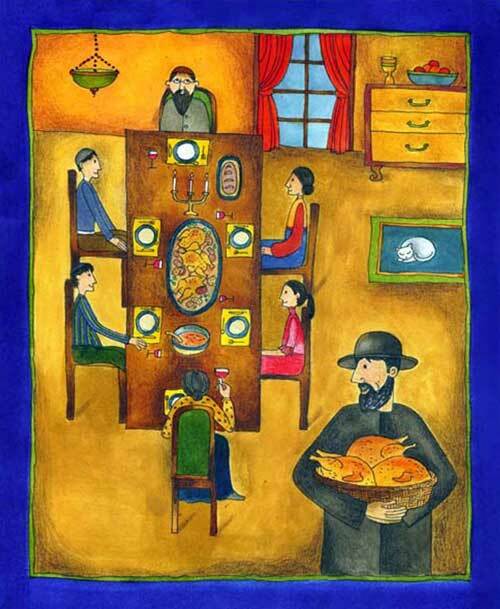 I love the way your illustrations convey each scene as a frame for the characters, almost like a theatre set, without filling in the backgrounds, and yet there are still plenty of details on which to feast the eyes (and ‘feast’ is the word, as there are lots of visual references to the food preparations). 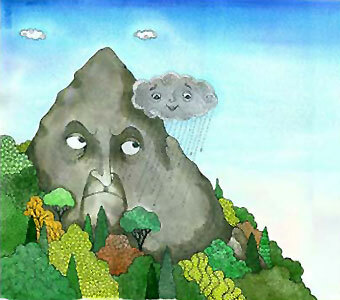 How did you go about researching and preparing your illustrations for this story? When Fawzia Gilani-Williams’ story Ismat’s Eid came to me, I got so many ideas to illustrate it that I kept trying out different styles and techniques. I ended up creating about eight options and I got so confused which to go for that I took all of them to the publisher – and they liked them all! So it was difficult to choose but we settled for the style you see in the book. 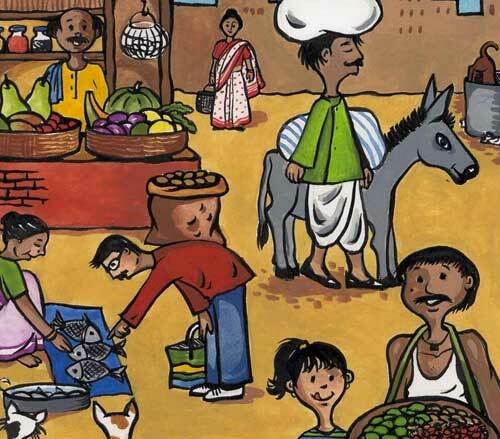 I could connect with the story a bit because I was married to a Muslim from Bangladesh and was familiar with their festivals and food. 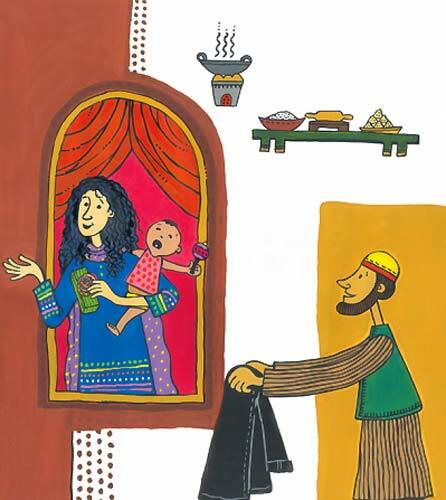 Other than that, I have many friends who follow the Islamic faith and most of the details and observations that came into my illustrations were from my own experience. Yes, I did compose the illustrations like a theatre set. I don’t have a studio really. I have a small corner where my worktable is. I manage within that area… everything is within my reach. If I need more space I just use any corner available in the house. 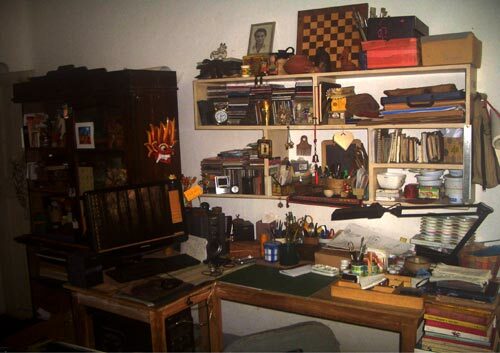 My little space is crowded with knick knacks, books, cds, craft objects, bits and pieces of paper, little boxes etc. and I love it that way. Do you take a sketch book with you when you are out and about? Not really; sometimes. I love to look around, observe and interact with animals and people. All that stays in my mind, and later they come into use in my work. I used to sketch quite a bit but now my method of working has changed. Now I observe and absorb. Can you tell us something about your dogs and how you came to have so many (seven, I think?)? Ahh, my dogs! Actually, I have 15 at the moment but the number keeps changing. Way back in the 90s when I was living in Calcutta (now Kolkata), I was staying in a neighbourhood that had too many street dogs and it was sad to see them fighting for survival and existence every single moment of their lives. I tried and fed as many as I could and took care of them in their sicknesses and in cases of accidents and even physical abuse, cruelty. The plight of these stray animals disturbed me and I started to get more and more involved in their welfare. It is very difficult for me to look away when I come across an animal in distress and that’s how I got into rescue work. I wish I could do much, much more. I’m very seriously thinking about running a shelter for animals but funding is a big problem. I’m trying to figure that out and how to go about it. Have your dogs featured in any of your book illustrations, or your art generally? Do you have any new books on the horizon and what are you working on at the moment? 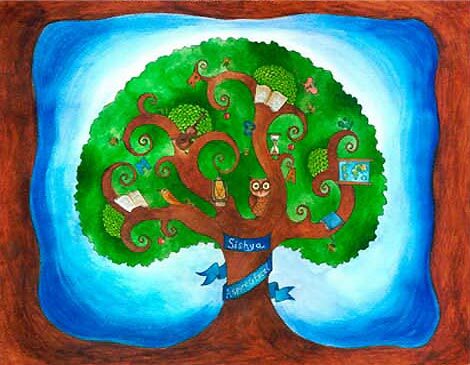 At the moment, I’m doing an English Grammar text book, an illustrated book of stories from the Quran, and a picture book about friendship for NGO Room to Read. For this last book, Room to Read held a workshop for a group of illustrators, and it was a great learning experience for us (illustrators) in terms of understanding how to create books for children who don’t belong to the urban group. In countries like India that’s a big part of the population. 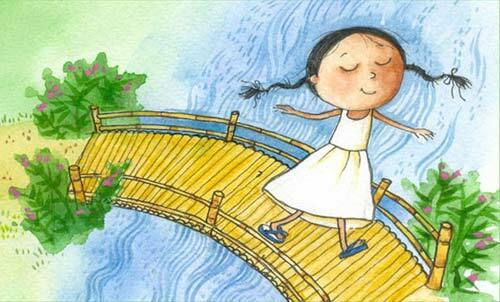 This book is a delightful story in Hindi, about flowers and a little girl. I used a lot of bright colours. 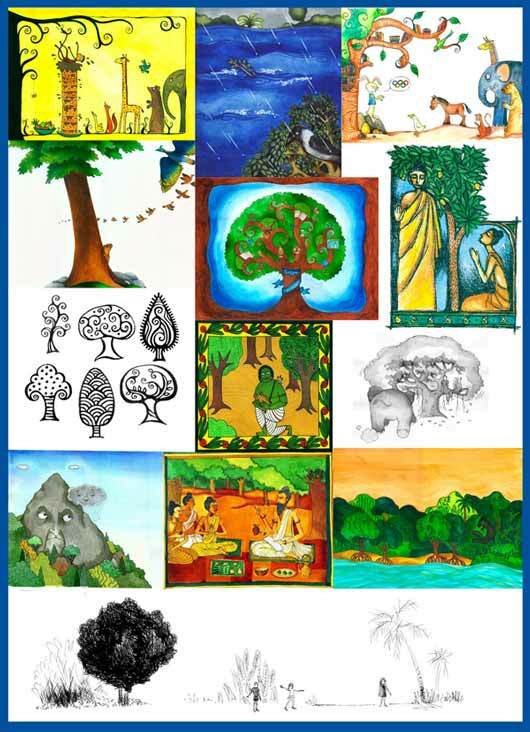 Rabindranath Tagore’s collection of poems for children. 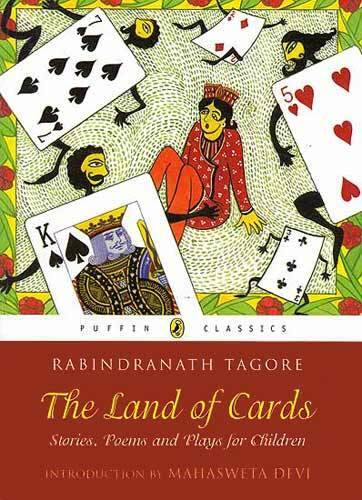 Not only did Tagore understand the mind of a child wonderfully, he portrayed the life in Bengal very beautifully. 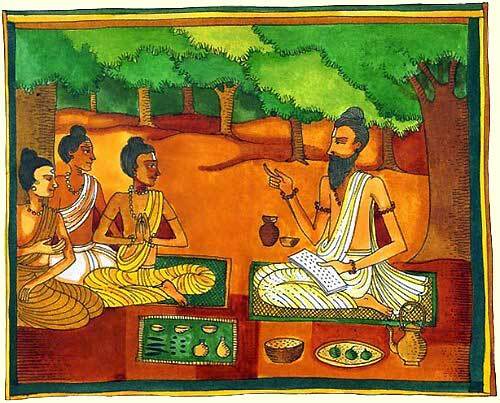 As a child growing up in Bengal I loved reading those poems and felt very close to them. Even now, when I read them after all these years, it’s like coming home. 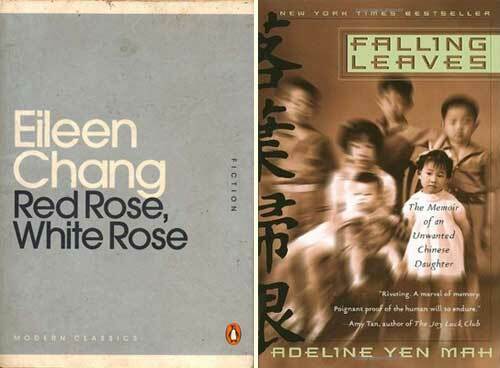 Red Rose, White Rose by Eileen Chang and Falling Leaves by Adeline Yen Mah (a memoir). Both are about China. I am very curious and fascinated by the Chinese history, culture, their art and craft and most importantly their cuisine. 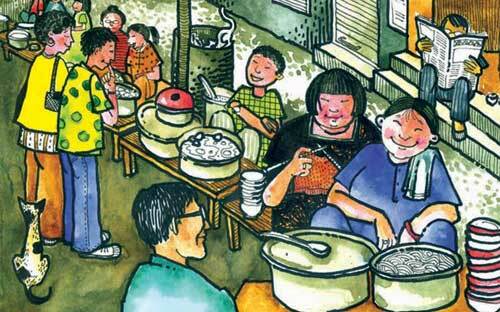 I love to cook Chinese food and I always look for authentic and traditional recipes. That’s a tricky one to answer. I love both very much but if it rains it’s the beach; otherwise it’s the mountain. But basically both it is. Now I may have a few favourite trees. 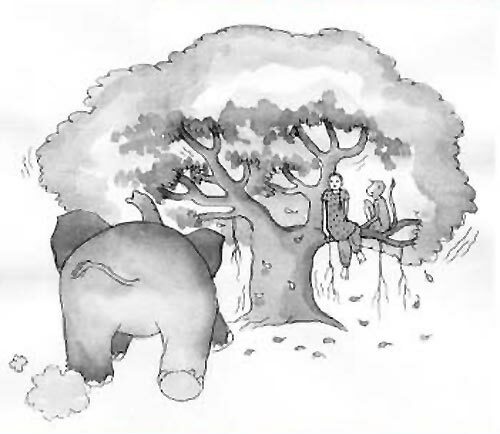 Let me think… the great Banyan tree and there are a few trees whose names I know only in Bengali… local names like Bokul, Heemjhuri, Shirish, Shaal and so many others. Notebook, always. In fact any piece of paper would do… doesn’t matter if it’s torn or just a scrap. An old photograph of my daughter when she was three (now she is 24). I am a little sentimental about that particular photograph. I like to have it close to me when I work. Travel. Quite a few books have brought out the longing for travelling in me. 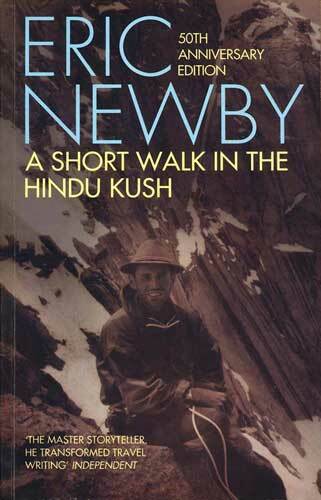 But right now, when I think of a book that comes to my mind in this regard, it is Eric Newby’s A Short Walk in the Hindu Kush (first published in 1958). I loved reading this book. But unfortunately I don’t have a chance to travel as I have to be around my dogs to take care of them. I may have a streak of OCD in me! Trying desperately to meet some deadlines and not panic. I also have plans to sit with my matchbox and post card collections and organise them. And update my website… long overdue. Thank you Marjorie, I really enjoyed our interaction and wish you the very best! 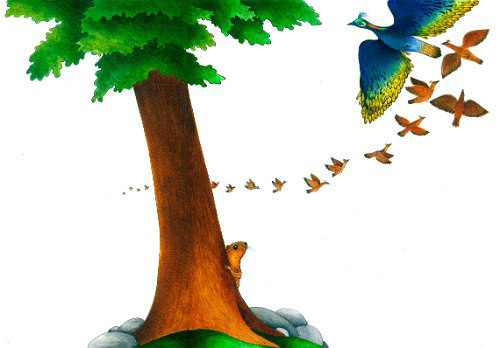 Enjoy exploring the wide-ranging styles of Proiti’s illustrations in this Gallery of her work that focuses on both trees and dogs and cats. Thanks to Proiti for permission to reproduce her illustrations here. 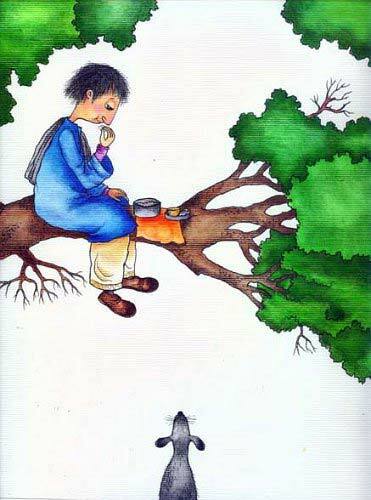 All illustrations and photographs are © Proiti Roy 2015 and may not be reproduced without express permission. 'Branching Across the World: Trees in Multicultural Children's Literature, 101 Indian Children's Books We Love, A Short Walk in the Hindu Kush, Adeline Yen Mah, Aditi Adventures, Anita Roy, Asha Hanley, Bulbuli's Bamboo, children's books about trees, children's books from India, Eileen Chang, Eric Newby, Falling Leaves, Fawzia Gilani-Williams, Four Friends, Gulla and the Hangul, Help! 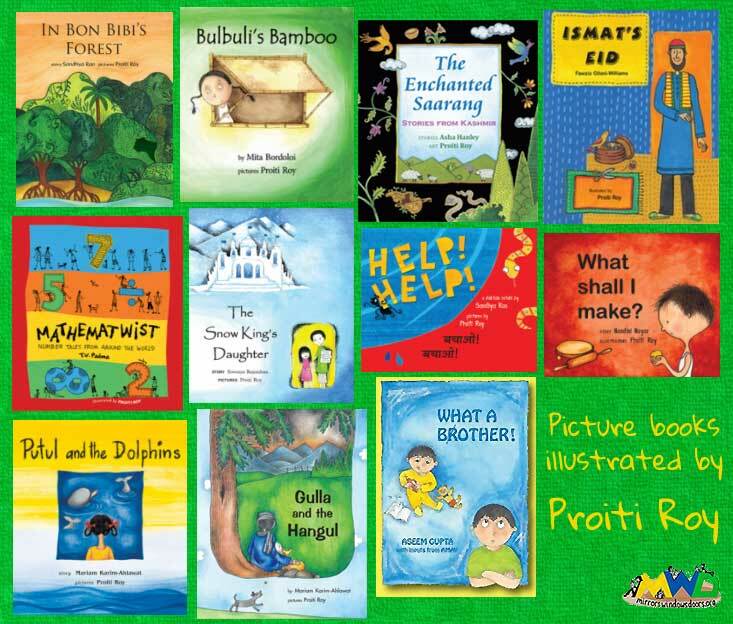 Help!, In Bon Bibi's Forest, Ismat's Eid, Kala Sashikumar, Mariam Karim Ahlawat, Mathematwist, Mita Bordoloi, MWD interview, Nabeel's New Pants: An Eid Tale, Nandini Nayar, Nirupama Raghavan, Panchatantra Tales retold for children, Pavo and Cavo, Proiti Roy, Putul and the Dolphins, Rabindranath Tagore, Red Rose White Rose, Samina Mishra, Sandhya Rao, Sowmya Rajendran, Suniti Namjoshi, T.V.Padma, The Enchanted Saarang, The Land of Cards, The Snow King's Daughter, Tulika Books, What Shall I Make?, Zubaan Publishing (India). Bookmark. I am in love with the illustration!and love for dogs! Excellent variety of work. Kids must be loving it! A very sensitive artist! 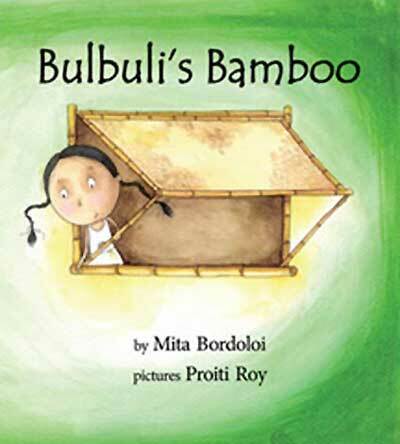 Read a Q&A with Proiti and author Mita Bordoloi about Bulbuli's Bamboo . 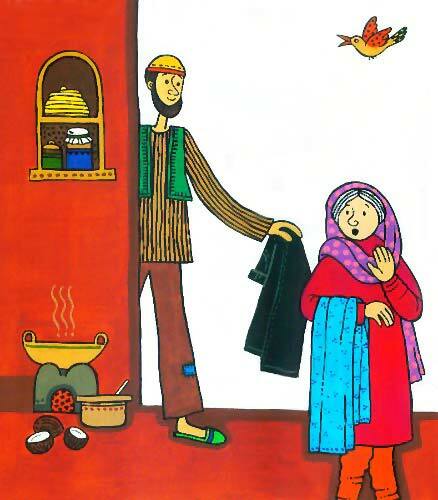 Read Sandhya Rao's commentary on the different book titles of Ismat's Eid / Nabeel's New Pants: An Eid Tale. 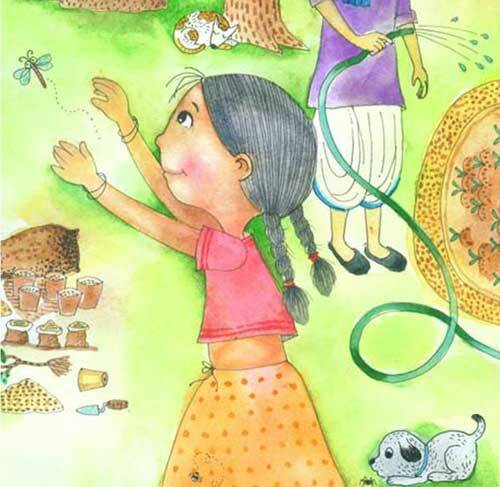 Read a review of Tulika's Panchatantra series, including Four Friends, at Saffron Tree.